Squash players all over the UK are up in arms at plans by David Lloyd Clubs to close the majority of their squash courts to make way for a new fitness circuit called Blaze. The gym and rackets-sports chain were last night accused of lying to their members after being challenged to explain the reason for using squash courts to deliver this new activity. Players are furious that squash, rated the healthiest sport of all, is being sacrificed to make way for an untried programme that David Lloyd clearly hope will turn into the latest money-spinning fitness fad. Several thousand members are understood to be affected by this new directive. Many have written to Squash Mad to complain. When I put their arguments to David Lloyd via email, my request for a media statement went unanswered. In response, I Tweeted: “Please clarify your remarks. You are expecting us to believe that various General Managers, at a number of locations, all decided independently to kill squash and use the courts for these untried Blaze circuits.” No reply was forthcoming. Squash Mad correspondent James Roberts reported on the situation back in February. 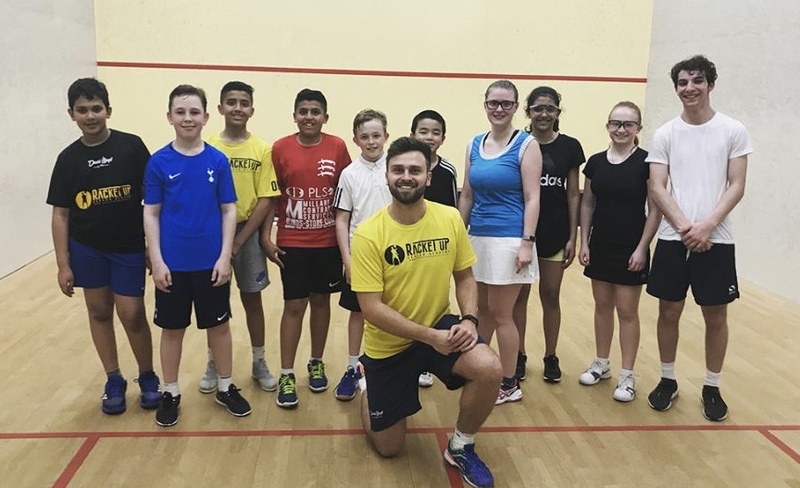 James, founder of the campaign to bring squash back to Corby, reported on the loss of two courts at David Lloyd Milton Keynes, despite the first team winning the Bedfordshire County League champions. He wrote then: “At Milton Keynes, they are losing two out of their four courts, and yet Mike Firth, team Captain, describes their squash section as ‘thriving’, with the team sitting proudly on top of the Bedfordshire League. David Lloyd clubs can expect to receive plenty more questions from disgruntled squash members fighting to keep their courts open. Laura Northeast, a lecturer in sports science at the Writtle University College in Chelmsford, Essex, is co-ordinating a campaign to keep the courts open at Gidea Park. Engerer’s successful programmes have increased squash membership at David Lloyd Gidea Park from around 70 players to more than 200 over the past year or so. Squash members in Gidea Park have launched an online petition to try to persuade the David Lloyd management to think again and change their mind about closing the courts. 1: Squash players stay loyal to their sport for much longer than gym members. 2: Squash players like to make their club their social hub. Look after them properly and they will reward you in turn with a bigger spend over the bar. 3: There are further revenue opportunities with a club shop selling rackets, shoes and clothing, and providing restringing of rackets. 4: Partner fully with squash and we will provide you with coaches and managers who will grow the business. 5: Squash is consistently rated one of the healthiest sports in the world. A recent health survey confirmed this. In an era when childhood obesity, and mid-life health issues, are likely to cost the NHS millions of pounds, you could be partnering with your local communities to promote squash and racketball sessions as a major boost to health and wellbeing. 6: Your dismissive and dishonest behaviour is grossly offensive and insulting to the sport of squash. 7: I have requested a statement from the David Lloyd media department. So far the only response has been a message on Twitter claiming that the decision has been taken by your Regional Managers. Others posting here claim this is blatantly untrue. To recap, I am awaiting responses from Sports Minister Tracey Crouch and from David Lloyd management. But it was nice to receive messages of support from leading international players Nick Matthew, Daryl Selby, women’s world champion Raneem El Welily, her husband Tarek Momen, Mohamed Abouelghar and numerous squash enthusiasts across the planet. JOIN THE DEBATE: Readers are invited to post their comments below. sadly this is no surprise to me. David Lloyd has never shown a major interest in squash. Their only interest is profit and falls in line with all these gymn chains. Personally I have never particularly enjoyed David Lloyd squash when playing in leagues etc as there is a slightly soulless atmosphere anyway. Hopefully all those David Lloyd members will fill the memberships of their available squash clubs and provide a boost in another way for the sport. Every cloud has a silver lining and this is true with David Lloyd. Let us squash players give our support to organisations worthy of our presence. David Lloyd are missing another BIG aspect – family activity. They have grown their membership on developing rackets sports facilities fo ALL ages and going down the line of ‘gym-only’ provision will alienate people at a time when inclusive programmes for children and adults of all ages – 5 to 85 – are being promoted by Government. Time for a re-think DL and time to talk, work collaboratively and get back to your origins; it will be a WIN-WIN! We have a similar issue at Sudbury Hill. Sudbury Hill is losing both of it’s squash courts (which is all of them). They are actively used but local management and Head Office don’t really seem to care. I totally support this petition even though I don’t play squash. I have friends in DL with whom I play tennis as well and I share their sense of devastation at losing the squash courts for such a pathetic reason as the latest trending ‘fad’ to suit an obsessed niche of members who already the latest equipment without ha big to pay the extra membership fees that racquet members pay. I have written my own letter of complaint to the local David Lloyd general manager, linking it with people equally and helpful modernisation of the locker I can reverse the benches, resulting in ridiculous overcrowding of the changing areas even in nonpeak times. At Southend we are too affected by the same poor communication and behaviour towards its members. In section 19d it states they have to provide 3 months notice to close the courts. When speaking to the new GM of the club he is fully aware they are in breach of their T&C but his was response was they will not hold us to the cancellation fee. This highlights their lack of care for its own customers. This now means that any UK member is bound to their T&C’s? This has left many members angry and shocked by their actions, communication is poor and no planning was put into managing the change process. Where was the consultation with members, frequently Q&A page, feedback sessions and group meetings? These are basic senior management skills..
We are having same problem with David Lloyd Teesside where decision made to close all 3 squash courts in spite of many, many squash playing members and a team that has just been promoted. Lack of consultation, very poor or no market research and innumerable complaints via direct and non direct means and an article in local paper pointing out the injustice and poor or rude response from manager and Lloyd CEO. It has all the hallmarks of someone being rewarded for the introduction of a new scheme in spite of huge opposition. Even non racket members are up in arms about an extra class for which they are asked to pay. They consider the existing fee enough. This just reminds me that David Lloyd are not in business to promote sport, but to make money. At my club they are getting rid of the hugely popular, brilliant Grit classes (the only group exercise class that attract women and men, young and old) so that they don’t compete with Blaze – so-called HIT training (45-55 mins!). Members are not happy.